A compact and elegant luxury cigarette case. Amazing Leather Look Cigarette Cases. Assorted colours and designs. FAST & FREE DISPATCH. Pocket size box so easy to carry around. Flip open action and internal elastic strap to keep the cigarettes securely in place. A compact and elegant luxury cigarette case. 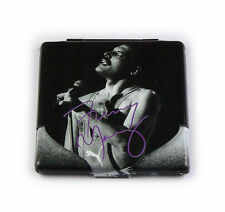 Amazing Leather Look Cigarette Cases. Flip open action and internal elastic strap to keep the cigarettes securely in place. Leather look. Pocket size box so easy to carry around. From NeedThatGift. Features a photograph of Freddie singing. Cigarette case with a hinged lid and a cut away design. Holds 10 king size cigarettes. A compact and elegant luxury cigarette case. 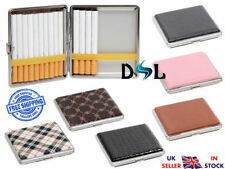 Amazing Leather Look Cigarette Cases. Assorted colours and designs. FAST & FREE DISPATCH. Flip open action and internal elastic strap to keep the cigarettes securely in place. Holds Superking size cigarettes on each side of the case. 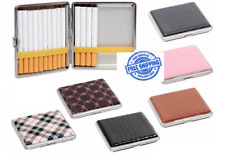 Other types of Cigarette cases available which hold King Size and Superking length cigarettes. Gold Effect Cigarette Case. Vintage cigarette tin Made In England. Comes with wear and tear due to age nice collectors cigarette tin please check my photos happy bidding.. Location: Battersea Bridge, London SW11. Limited Edition Marlboro Lights Metal Tin/ Cigarette Tin x 1. Condition is Used. Dispatched with Royal Mail 2nd Class recorded. Marlboro Lights Metal Tin. Highly collectible item. Was a special promotion item as packet of tens we’re being phased out. Have a few of these so if you interested in more than one, please let me know. Please note I can only post on Saturdays, so bare this kind of purchasing. One Piece Stainless Steel Tobacco Can Humidor. - The inner of tin polished and shiny. - Thickened handle and good sealing performance. - The stainless steel surface is smooth and fine. - Color: Silver. One Piece Stainless Steel Tobacco Can Humidor. - The inner of tin polished and shiny. - Color: Silver. The product is new and in good conditon, just go ahead and buy! People always bought together with. One Piece Stainless Steel Tobacco Can Humidor. - The inner of tin polished and shiny. - The stainless steel surface is smooth and fine. - Material: Stainless Steel. - Color: Silver. People always bought together with. One Piece Stainless Steel Tobacco Can Humidor. - The inner of tin polished and shiny. - The stainless steel surface is smooth and fine. - Material: Stainless Steel. People always bought together with. One Piece Stainless Steel Tobacco Can Humidor. - The inner of tin polished and shiny. - Thickened handle and good sealing performance. - The stainless steel surface is smooth and fine. - Material: Stainless Steel. One Piece Stainless Steel Tobacco Can Humidor. - The inner of tin polished and shiny. Due to the different display and different light, the picture may not reflect the actual color of the item. People always bought together with. A compact and elegant luxury cigarette case. Amazing Leather Look Cigarette Cases. FAST & FREE DISPATCH. Pocket size box so easy to carry around. Flip open action and internal elastic strap to keep the cigarettes securely in place. One Piece Stainless Steel Tobacco Can Humidor. - The inner of tin polished and shiny. - The stainless steel surface is smooth and fine. - Material: Stainless Steel. - Color: Silver. Good quality! Excellent Service! One Piece Stainless Steel Tobacco Can Humidor. - The inner of tin polished and shiny. - The stainless steel surface is smooth and fine. - Material: Stainless Steel. - Color: Silver. Due to the different display and different light, the picture may not reflect the actual color of the item.